Midwives supported 10.8% of the births in Canada in 2016‑2017. The rates of midwifery‑led birth varies from province to province to territory. 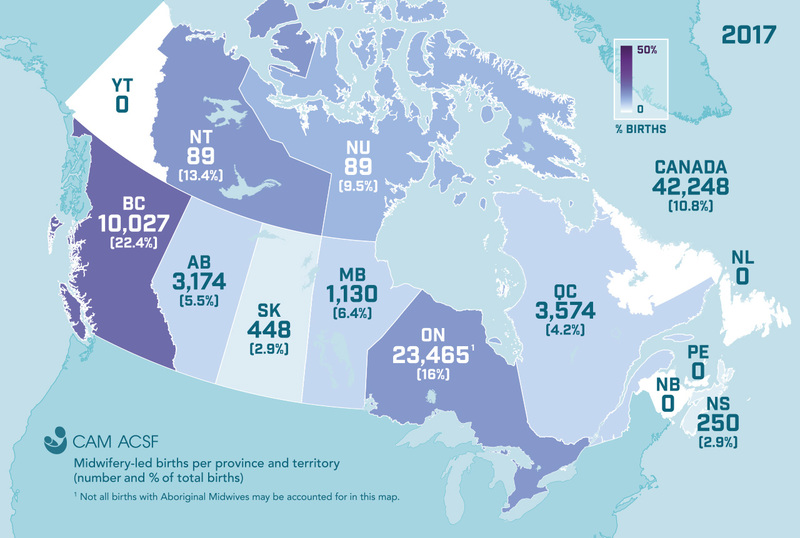 Currently, British Columbia leads the country in highest percentage of midwifery-led births (22.4%) and Ontario leads in total number of midwifery‑led births (23,465 per year). Please note that midwifery‑led births refers to births in which the midwife was the primary health care provider for at least the majority of the pregnancy. Data on total births from Statistics Canada for the period July 1, 2016 to June 30, 2017. Data on midwifery‑led births and number of midwives is from the same time period if available, and if not, from as similar a time period as possible.